vegan food, cooking, life, and love. 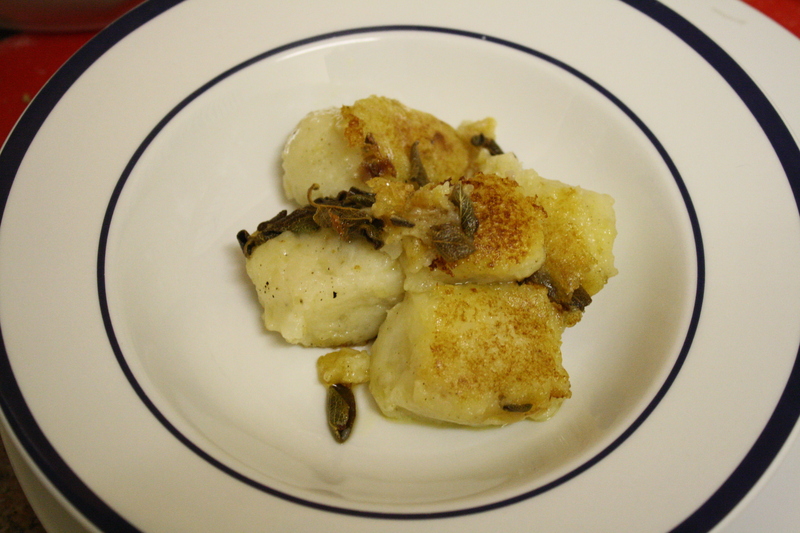 Gnocchi is one of those things which I just love to make. It’s pretty easy, it’s pretty messy and it’s just all round good fun! This is a particularly tasty and easy gnocchi recipe, which not only passed the S test of tastiness, but has been fed to others with similar results! Great with a nice big and bold red wine. You’ll need 6-8 largeish potatoes (for four big serves). If you have the time, bake your potatoes from the start, otherwise steam or boil until almost cooked through, then bake them off at the end, throw in a few garlic cloves when you put your potatoes in the oven. When they’re ready, mash the potatoes really, really well before adding a small amount of Nuttelex, a pinch of ground sage, 2 or 3 cloves of roasted garlic and a few heaped tablespoons of all purpose flour and kneed it all together. The most important thing with gnocchi, I think, is to rely on your instincts! If you think your gnocchi dough needs more flour, add more. If you think it needs some liquid, throw in some rice milk. Once you’re happy with your dough you can either roll it out into a long snake, and cut off equal parts or you can shape your gnocchi separately. I like big, square gnocchi, so I generally shape them. 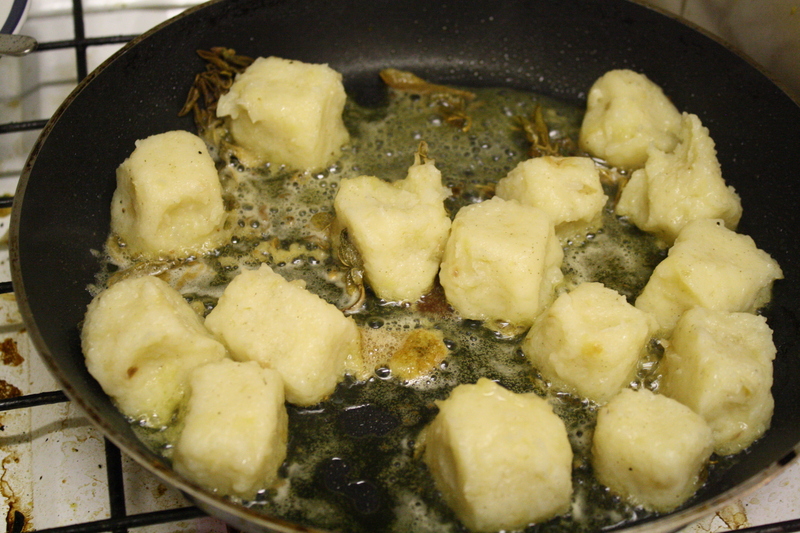 Bring a large saucepan of water to a rolling boil and lower a few of the gnocchi in at a time. As soon as each one rises to the surface, pull them out and straight into a colander, and then onto a clean tea towel. Go through until they’re all cooked and on the towel. While the gnocchi is drying out a bit, throw a chunk of Nuttelex into a frying pan and, once its melted down, throw in some fresh sage. 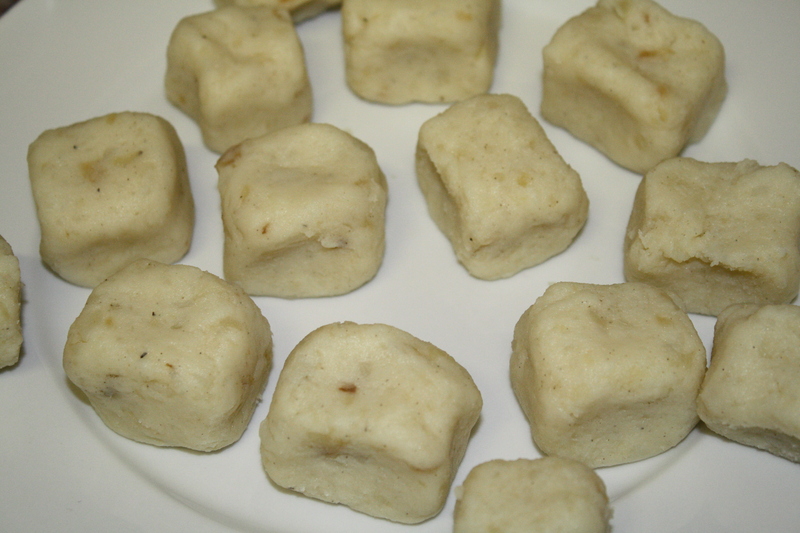 Once the Nuttelex has melted down, put the gnocchi squares in and just throw them around a little bit. I like to mainly crisp the gnocchi up on two or three sides, rather than the whole thing – but you can do whatever you feel like!